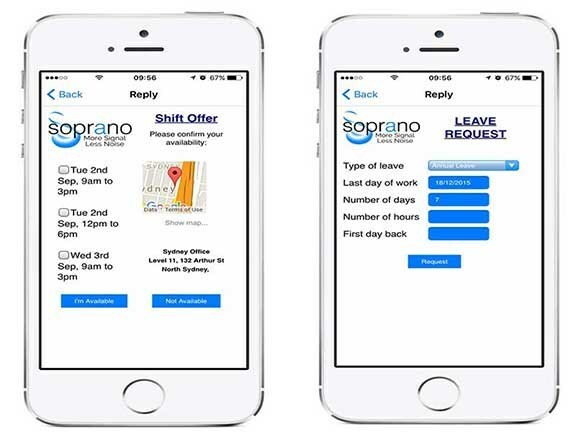 Soprano’s GAMMA smartphone app can be used for rostering, signing off on deliveries and more. A secure smartphone messaging system with inbuilt workflow tools is aiming to aid management and improve productivity in plant and equipment companies. Australian software developer Soprano Design’s Soprano GAMMA app has just been granted global certification, recognising its adherence to the security and encryption needs of government departments in 25 countries including Australia, North America and the United Kingdom. The certification comes following an evaluation by global cyber security experts BAE Systems. Developed over three years with the materials handling and supply chain sectors in mind, Soprano’s GAMMA app uses encryption and other security features including PIN protection, remote wipe and vanishing messages. Soprano Design CEO Horden Wiltshire says message auditability allows a logistics firm to confirm date and time information and confirm who has accepted or rejected a delivery. "It allows firms to build messaging into the OH&S process, with text reminders to complete training, take breaks, as well as clocking in and clocking off for subcontractors via SMS," Wiltshire says. "Workflows forms were designed to outfit customers with the tools to bring manual processes online at a fraction of the total cost of ownership of custom mobile apps or extranets." The app can be used to facilitate proof of delivery, driver’s logs, job dispatch, driver safety and emergency communications and delivery manifests. "There are a number of practical, everyday applications for logistics operators, from arrival contacts at warehouses and two- way messaging, to job matching when a company may need contractors in peak times," Wiltshire says. The technology built into Soprano GAMMA, and its messaging platform MEMS (Mobile Enterprise Messaging Suite), also enables companies to analyse business data to monitor performance. A recent study into the management of distribution centres undertaken by Intermec Technologies Corporation canvassed 250 senior managers across Europe and North America and concluded that there is a constant desire to make workplace processes more efficient. "The research estimates that up to 3,000 hours per year are lost at distribution centres due to inefficient processes and nine out of 10 managers see new technologies as the answer to combat this," Wiltshire says. "Our own logistics’ client feedback shows that business measures time savings in seconds, because improvements in a task that is done over and over by multiple workers — can ultimately save hundreds if not thousands of hours." Soprano Design is a Sydney-based designer and provider of secure mobile messaging that was founded in 1994.